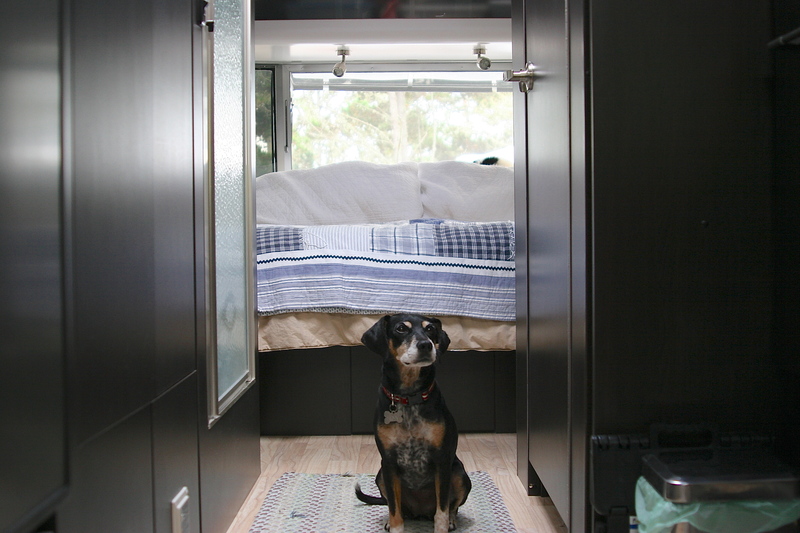 It’s easy to look at Airstream trailers when the only objective is just that – looking. When Kelly and I decided to commit to purchasing, that is when the hard part began … we had to choose something and then live with that decision. During the process of looking, we eliminated many layouts, but the daunting task remained … settle on one floorplan and live with the decision. Ultimately, we landed upon the International Signature Series – ’27FB CCD. We love it. For the uninitiated reading this, that mumbo-jumbo translates essentially to the following: a hipster cool interior design, 27 feet in length, with a front bedroom location. If you still don’t follow, perhaps some pictures will help. 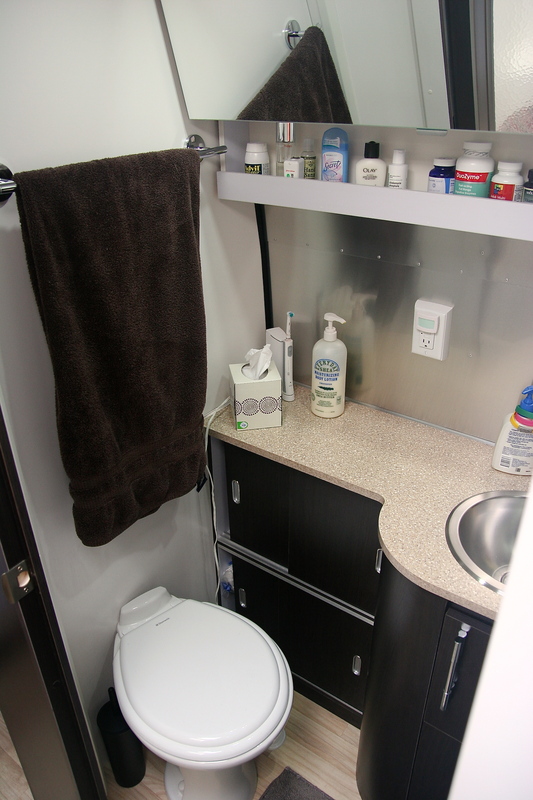 UPDATE : Our current dining/lounge/desk area is not stock from Airstream. You can read about the (June 2016) conversion process in this post. Pictures of the stock layout can be viewed in the slider below. 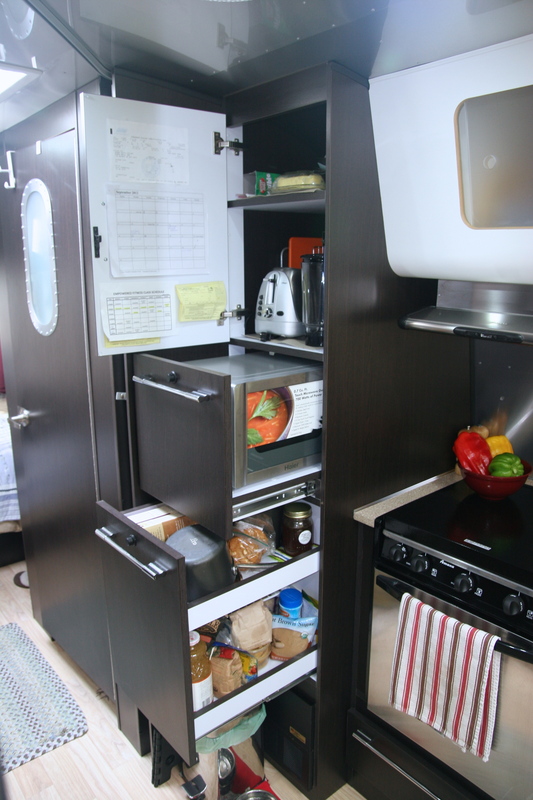 UPDATE: Since taking these pictures, we removed the microwave oven in order to repurpose the space as additional storage. You can read about the (July 2013) conversion process in this post. Thanks for the photos. It looks very efficient. Where has Mooster claimed a permanent spot? When people come to visit, where do they sleep? Thanks for the great pics! We really appreciate the ones inside of your cabinets to see how you organize! We are purchasing either this model or the Eddie Bauer 27 foot. Decisions, decisions! Thanks for the comments. If you wish to see any additional pictures, I’d be happy to share. Keep in mind that we live full-time in our rig (and work corporate gigs in an office), so the amount and type of items we maintain will be different from those using the trailing purely for recreational purposes and/or work from home. Accordingly, our storage reflects this reality. Also, since these pictures were taken, we’ve since removed the microwave and turned that space into additional pots/pan storage. I documented that conversion in a blog entry. Congratulations on going fulltime! Is that a kitty on the bed? Does it travel with you? If so, how does it do? Thanks for the note – we are super excited to be on the road. The cat passed away about a year ago, so she is not joining us on this portion of the adventure. My wife and I are purchasing a new 27FB International Serenity with Oyster colored seating just like yours. How is the light colored fabric holding up and does it clean well? Hi Mike – in three years of fulltime living we had no issues with the leather, which included a dog regularly jumping on the seating. The material is durable and cleans easily. Btw, I purposely use “had no issues” because swapped all new seating in June as part of our remodel. Now we have a non-Airstream leather product. 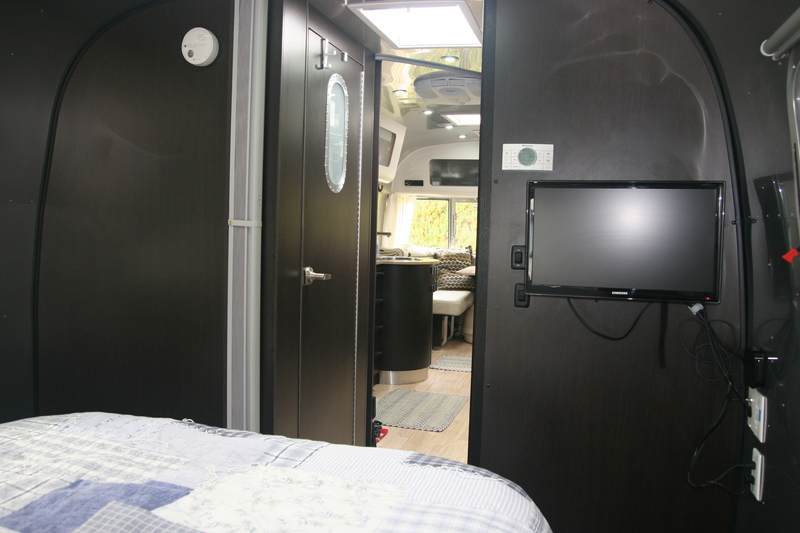 Happy purchasing, and welcome to the Airstream club … I’m sure you will love the new rig. Thanks for the reply Dave. We ended up ordering an International Signature instead of the Serenity but we stuck with the Oyster cushions. It will be similar to yours. One more question…maybe more questions in the future though…do you have a generator? and what kind, and how large? 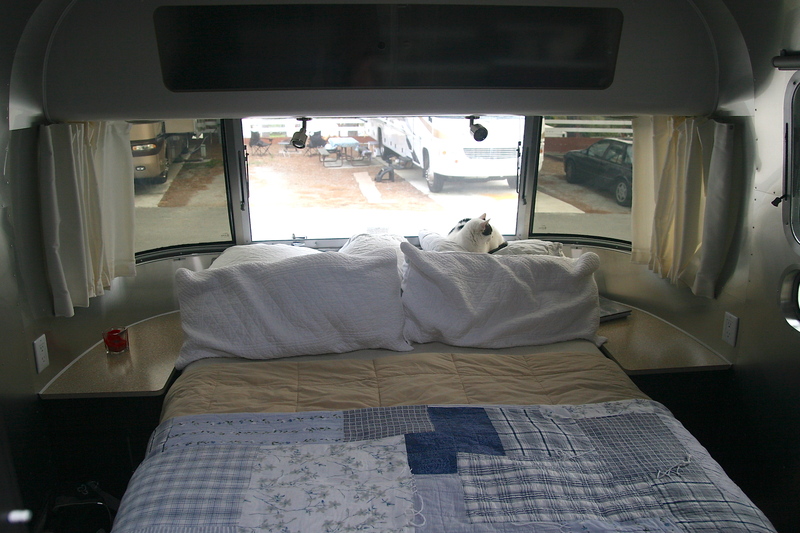 We don’t take possession of our Airstream until late winter and don’t plan on leaving on our adventure until May but am planning well in advance. We are planning a small to medium size solar system (maybe up to 400 watts). I think that will be sufficient for boondocking without air conditioning. As I understand, it would take approximately a 3000 watt generator to run the air conditioner while boondocking. Not sure how much we’d need it, so maybe just a smaller one to charge batteries if needed. Any thoughts would be appreciated.